Everyone except homo economicus knows that our brains have multiple processes to make decisions. Are you going to make the same decision when you are angry as when you sit down and meditate on a question? Of course not. Kahneman and Tversky have famously reduced this to ‘thinking fast’ (intuitive decisions) and ‘thinking slow’ (logical inference) (1). Breaking these decisions up into ‘fast’ and ‘slow’ makes it easy to design experiments that can disentangle whether people use their lizard brains or their shiny silicon engines when making any given decision. 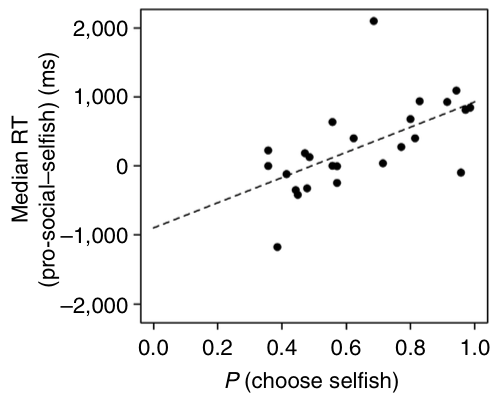 Here’s how: give someone two options, let’s say a ‘greedy’ option or an ‘altruistic’ option. Now simply look at how long it takes them to to choose each option. Is it fast or slow? Congratulations, you have successfully found that greed is intuitive while altruism requires a person to sigh, restrain themselves, think things over, clip some coupons, and decide on the better path. This method actually is a useful way of investigating how the brain makes decisions; harder decisions really do take longer to be processed by the brain and we have the neural data to prove it. But there’s the rub. When you make a decision, it is not simply a matter of intuitive versus deliberative. It is also how hard the question is. And this really depends on the person. Not everyone values money in the same way! Or even in the same way at different times! I really want to have a dollar bill on me when it is hot, humid, and I am front of a soda machine. I care about a dollar bill a lot less when I am at home in front of my fridge. So let’s go back to classical economics; let’s pretend like we can measure how much someone values money with a utility curve. Measure everyones utility curve and find their indifference – the point at which they don’t care about making one choice over the other. Now you can ask about the relative speed. 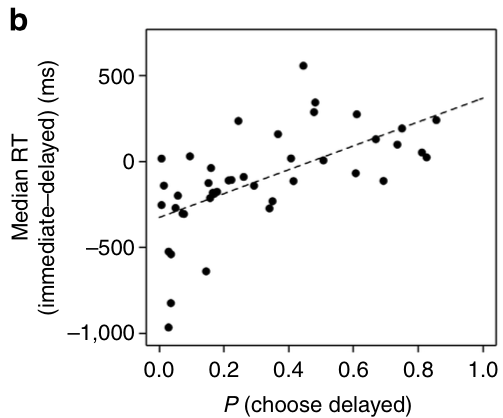 If you make each decision 50% of the time, but one decision is still faster then you can say something about the relative reaction times and ways of processing. And what do you find? In some of the classic experiments – nothing! People make each decision equally as often and equally quickly! Harder decisions require more time, and that is what is being measured here. People have heterogeneous preferences, and you cannot accurately measure decisions without taking this into account subject by subject. No one cares about the population average: we only care what an individual will do. But this is a fairly subtle point. This simple one-dimensional metric – how fast you respond to something – may not be able to disentangle the possibility that those who use their ‘lizard brain’ may simply have a greater utility for money (this is where brain imaging would come in to save the day). No one is arguing that there are not multiple systems of decision-making in the brain – some faster and some slower, some that will come up with one answer and one that will come up with another. But we must be very very careful when attempting to measure which is fast and which is slow.